Over 8,800 feet of high-speed thrill on one of the worlds longest ziplines. Book your zip line adventure today! We apologize for any inconvenience. The Zipline is closed currently. Advance Reservations Required for Everyone. Adults must accompany minors under the age of 18. Any special needs must be communicated at the time of reservation. Some restrictions may apply for safety reasons. Management reserves all rights. Thank you for your understanding. Take your zipline adventure experience above and beyond with this three-span Zip Line. This beautifully stunning adventure begins and rises above 11,000 feet. It is also complete with parallel cables so riders can glide down the mountain side-by-side. The adrenaline-pumping, three-part zip tour reaches over 8,900 feet in length, making it one of the longest ziplines in the world while offering a thrilling and unforgettable experience. Print out your ticket receipt or confirmation to bring with you along with a valid ID (Military ID required to claim Military Ticket for Individual Service Members Only. No Dependents). Call 575-464-3633 before your scheduled ZipTour time to check the weather. Arrive 20 minutes early to your scheduled time. Bring your printed receipt or confirmation along with a valid ID to any of Ski Apache’s ticket windows and start your ZipTour adventure! Military Discount: Individual Service Members Only. No Dependents. Windrider Ziptour is for Everyone! 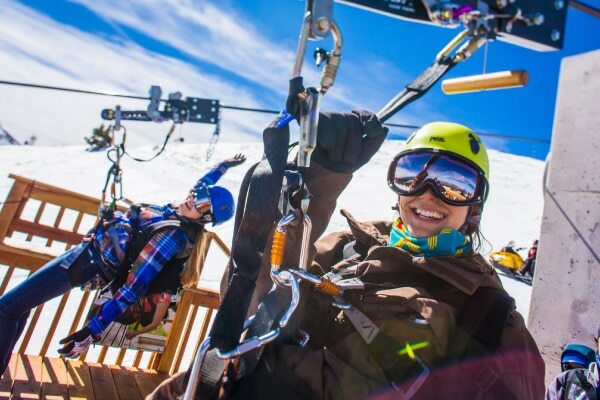 Ski Apache invited Southwest Interpreting Service to come and experience the Apache Wind Rider ZipTour, to help create a safe and fun experience for our hearing–impaired guests who come to enjoy the Apache Wind Rider ZipTour. Book your next adventure today! Advance reservations are required. Please note if special accommodations are needed when you make your reservation. Prices are subject to change without notice per zip and ski area management. Please read all the information before traveling up the mountain. Reservations are required 24 hours in advance due to high volume. ZipTours may be canceled due to excessive wind or fog. Please call to confirm on your scheduled day to check on weather conditions and to make sure its operating. This policy is in place for you safety and the safety of others riders/guides. All terms and details are subject to change at the sole discretion of Ski Apache/ZipTour Management.